Warriors vs. 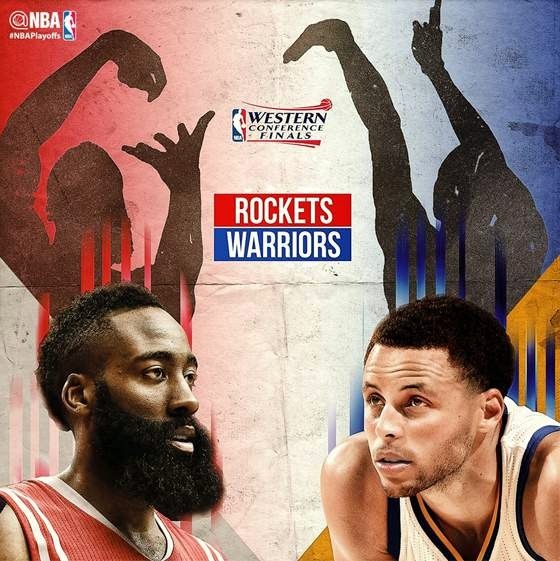 Rockets: TV Schedule (BTV and ABS-CBN) - NBA Playoffs 2015 Western Conference Finals - Balita Boss! The number one seed Golden State Warriors will face the number two seed Houston Rockets in the Western Conference Finals of NBA Playoffs 2015. The Rockets are returning to the conference finals for the first time since 1997 after completing the 3-1 series comeback against the Los Angeles Clippers. While the Warriors, who eliminated the Memphis Grizzlies in six games, are in the conference finals for the first time since 1976. The Warriors went 4-0 against the Rockets in the 2015 NBA regular season, winning by an average of 15.3 points. Season MVP Stephen Curry of Warriors and runner-up MVP James Harden of Rockets will now lead their respective teams in the Conference finals. Curry’s regular season: 23.8 points per game on 48.7 percent shooting from the floor and 44.3 percent shooting from the three-point line to go along with 7.7 assists. Harden’s regular season: 27.4 points per game on 44 percent shooting from the floor and 37.5 percent shooting from the three-point line to go along with seven assists. They will see who finishes first and second in the West with a berth in the NBA Finals at stake. Here's the complete schedule, TV info and start time. Warriors won the series 4-1.